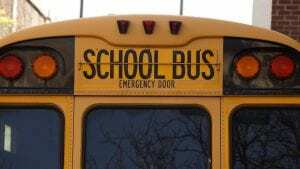 Shirley, NY (March 25, 2019) – According to police, a school bus driver for Patchogue-Medford School District has been arrested after he allegedly kissed a 15-year-old girl while she was alone on the bus. The incident was reported to have happened last Tuesday, although it was reported until days later, and the driver was arrested at his home on Sunday night, March 24th. The incident was stated to have happened along Main Street in Patchogue. According to police, Joel Cedeno, of Shirley, pulled the bus over while the girl was the only one on board and proceeded to ask her for a hug. The teen girl offered a handshake instead, at which point he forcibly kissed her. Cedeno has been arrested for endangering the welfare of a child and will be arraigned in May. The investigation is ongoing at this time, as Cedeno’s attorney says there are cameras on the bus; however, there has been no mention of what the footage may show. This story will be updated as more information surfaces. Before moving forward, we would, first and foremost, like to offer our sincere sympathies to the victim of the accused, as we maintain hope for her ability to mentally and emotionally recover. While this incident could have been much worse, there is no telling the fear and mental trauma that can occur when a child is subjected to the inappropriate advances of an individual, especially when an adult has the victim alone. It is important to understand that, as the victim of any form of sexual abuse in New York, you may likely have rights in terms of recovering compensation for the misconduct you experienced. At Hach & Rose, we are devoted to holding abusers responsible for their actions. Above all else, our compassionate attorneys are dedicated to providing victims with the most knowledgeable and experienced representation possible. If you or a loved one have been the victim of sexual abuse of any kind, please don’t hesitate to contact our attorneys at 212-779-0057 today.